If you are looking for high quality locksmith services, you’ve just arrived to the right place. We provide automotive, residential, and commercial locksmith services in Easton, PA.
Our locksmiths are here, 24hr a day, 7 days a week. Under those circumstances, we’re working weekends and holidays, too. When it comes to professional locksmith experts, we are your local locksmith choice, not to mention, the fastest choice. No matter what kind of locksmith service you require, first thing to remember, as soon when you call us, we can get you back on your day, in no time. We serve our Easton community to provide happy customers with excellent locksmith service. Our customers gets value for their money, and at the same time, high quality of locksmith service! We are the competent locksmiths you need at any time you want to service your car, house, or office locks. The most compelling evidence is when it comes to fast local locksmith service, we’re your best option. At any given time, our emergency locksmiths in Easton PA, will be there for you. And provide you with the fast emergency service you expect. We are committed to providing our customers with the security solutions that best meet their unique requirements. Using high quality of security hardware, combined with professional installation, we ensure your complete satisfaction. LockTech24/7 has been serving Easton, Bethlehem, and Allentown, for many years. We are local locksmiths specialize in all lock and key related problems, whether for your car or your home. While so many of our competitors are outright scams, you know that by choosing us, you’re making the right choice. It must be remembered that online advertising is full of shady locksmiths. At LockTech24/7, we take a great pride of serving Easton community. And in maintaining a close working relationship with our customers, make them confidence to call us all the time. These customers are calling us for every security needs. Whether they need open a door, or replace the locks on their doors. With this in mind, we also offer you a 90 days guarantee on products and labor. We proudly announcing that we provide a cost-effective security solution in many situations and an extensive range of inventory that solves any lock and key issue. Since we are local Easton locksmith company, helping our customers in emergency and non-emergency locksmith situations, we know Easton PA very well. We offer you personalized service customized to your unique needs, coupled with friendly service. That also combined with low rate to complete your satisfaction. Whether you’re calling us to prevent a break-in, or you already got victimize by break-in, please call us. We are here to help! 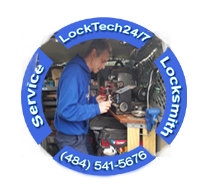 LockTech24/7 is a family own and operate mobile locksmith company. We do not use subcontractors, nor using a call center. We know that you’re short on budget, you didn’t plan to lock yourself out of your home, so we’re here for the rescue. We have the expertise, experience and resources to undertake any locksmith service throughout Easton, and the Lehigh Valley.